CLEARFIELD – Lock Haven University senior, Dan McGonigal, is preparing for medical school in the fall, but his LHU education began when he took dual enrollment classes at the university’s Clearfield campus as a senior at West Branch High School. When McGonigal was a junior in high school, he was not certain what he wanted to study or where he wanted to attend college. When his search produced that he could take classes at LHU Clearfield while he was still in high school, he saw his opportunity. Attending a Clearfield campus open house and meeting faculty and staff helped him learn about, and then choose, general education classes to begin this path. The first course was anatomy and physiology 1, with professor Dr. Amy Way, an expert in her field. “After having class with Dr. Way, I knew that if she was a reflection of the rest of the Health Science Department at LHU, then that’s where I would want to go to school,” McGonigal said. Dr. Way remembers the drive and determination that he had, and still has. McGonigal then went on to take more dual enrollment courses, applied to LHU and became accepted. After working hard that first summer and completing four more courses, he began courses at the main campus. He made dean’s list in the fall, and then each semester thereafter. “Because of all the courses I took before even graduating high school, I shaved a year off my time here at LHU,” McGonigal said. Way’s influence was paramount, and her co-curricular influenced McGonigal’s passion. Way works with students facilitating international service-learning programs. On these trips, students plan and implement a service-learning program in a rural community. “The focus of the course is on health care access, and as a complement of the class, the students prepare and deliver educational units on a variety of topics relevant to the population,” Way said. When she advertised her Jamaica trip during McGonigal’s class, he was very interested in going. He applied for the trip before he had even graduated high school and was accepted to travel to Jamaica in January of 2017. Around the time of his first trip to Jamaica, he had declared his major as pre-physician assistant (PA). 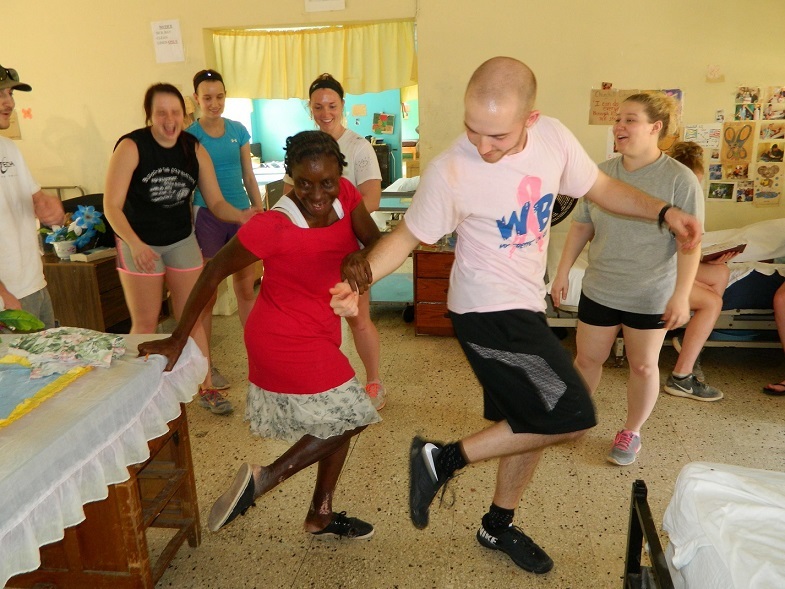 During his experience in Jamaica, he had the opportunity to work side by side with graduate physician assistant students who were running the clinic. Way said she had the opportunity to observe McGonigal in a variety of situations, delivering his lesson, speaking with patients waiting in the clinic, learning from other PA students as well as working with his peers and other Jamaicans. What she found in him was a sincere desire to learn and then apply his knowledge in real world situations. After just one year at LHU main campus, he started exploring options for medical school. “After I finished my first two semesters with good grades, I decided medical school was the right choice,” he said. It was on the second trip to Jamaica in 2018 that he conducted research work independently with Way. Part of his research required him to go out into a small rural community in south central Jamaica with two Jamaican guides to collect blood pressure data. He analyzed the research and wrote a paper about his work that has been submitted for publication. During the summer of 2018, he began his medical school prep, taking the MCAT (medical college admission test) exam and began applying to medical schools. In December of 2018, after interviewing at three schools, he was accepted to Touro College of Osteopathic medicine. He also returned to Jamaica a third time in January this year. Following graduation in May, he will attend Touro on a path to become a doctor of osteopathic medicine in Middletown, N.Y. After two years in the classroom, he will begin clinical rotations throughout the greater NYC area and parts of the lower Hudson Valley. For more information on Lock Haven University Clearfield, visit www.lockhaven.edu/Clearfield, e-mail clearfieldadmissions@Lockhaven.edu or call 570-814-3405.